At Great Water USA, we provide all-in-one whole home filtration systems and under-the-sink drinking water systems which creates bottled-quality water from your existing water source! Our systems are proven to remove common and not-so-common contaminants so you can be worry-free when it comes to the water going into your body and on your skin. If you can picture your life with less time spent cleaning and worrying about what’s in the water you drink, then you can picture your life with water treatment from the professionals at Great Water USA. 1. 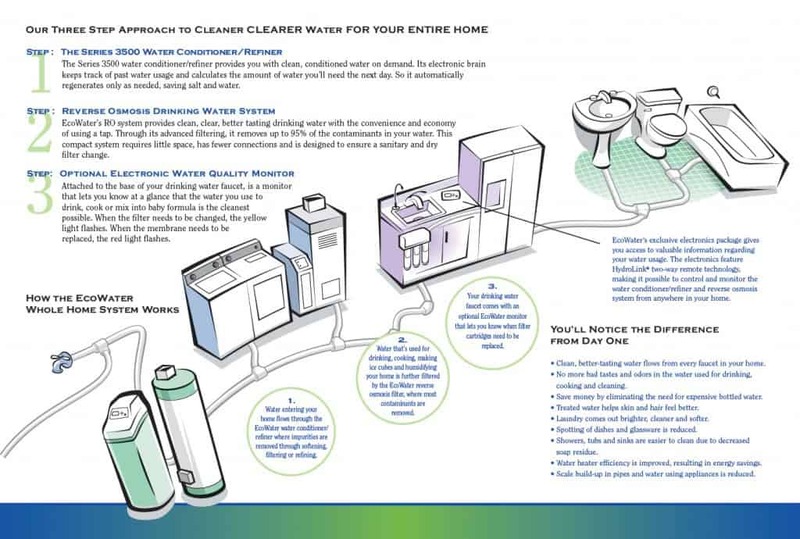 WHOLE HOME CHLORINE REMOVAL: Chlorine is a nasty but necessary chemical used to disinfect municipal water supplies. Although it’s good for killing bacteria, it’s bad for your skin and your health. Over-the-counter chlorine filters for your shower and sink only can do so much before they themselves get overrun with bacteria and buildup. 2. WATER HARDNESS REMOVAL: We all know the telltale signs of hard water. Just like flies in the springtime, those pesky hard water spots, scale in the bathtub, and embarrassing cloudiness on the wine glasses keep coming back again and again. Great Water USA offers a variety of hardness removal systems that ensure sparkling drinking glasses, clear shower glass, soft skin and hair, and lots of suds in your bubble bath (of course now you’ll have time to be IN the tub, instead of scrubbing the tub). 3. DRINKING WATER CONTAMINANT REMOVAL: These days we can spend hours, if not days, pouring energy into worrying about the chemicals and contaminants we consume. As an increasingly health-conscious nation, we all are becoming aware of the necessity of clean drinking water. We’ve all heard the statistic that water makes up 70% of our bodies (studies show in babies and small children water can make up even more). Fill Out the Form Below & Contact Us Today! New customers get a $200 Trade-In Credit on any water softener!